So, public review time. 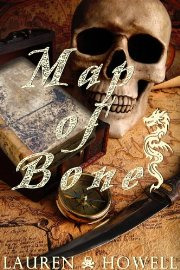 “Map of Bones” by Lauren Howell is a map of adventure. I gave it 4 stars and I highly recommend this little gem to anyone who wants a fast paced quick read that will leave you waiting for more. here is my Amazon Review. I saw check it out when you get a chance. you can find Lauren at the following locations. This entry was posted in Book Reviews and tagged Book Reviews, books, ebook, fiction, reviews, Writing. Bookmark the permalink. Sounds like an exciting adventure! Nice review. I might pick it up, I love quick-reads!